One of the best things about living here in New Hampshire is the four distinct seasons, and with each of those seasons comes a special coffee. Winter brings the holiday coffees such as Eggnog and Cranberry Creme Brulee, along with some of the heavier straight coffees like French Roast. As the calendar flips to spring our thoughts turn to warmer days and the coconut coffees (Hawaiian Coconut and Emerald Delight) are there to help us along. In the summer months the fruity coffees, such as Chocolate Raspberry and Blueberry Cinnamon Crumble, are in demand. Then autumn is suddenly here and Pumpkin Spice is the order of the day. Along with all of these great flavors, we also make special seasonal espresso drinks; Skinny Snowman Latte, Pumpkin Patch Mocha and our Eggnog Latte just name a few. Be sure to stop in throughout the year to see what's brewing. As warm and welcoming as our fresh brews, Coffeeberries is the place to savor a slower pace of life. From your morning cup to go, to gourmet tastes and gifts for even the most discriminating palates, our staff is ready to serve you with a smile. We offer K-cups and custom blended coffees and teas, as well as gourmet foods and specialty gifts representing the very best of New England. 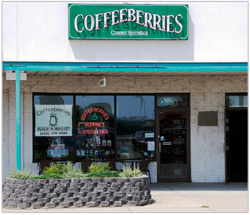 Always fresh, always flavorful, at Coffeeberries, we have just the thing to bring a smile to your face. So what are you waiting for? Stop in our store in the Londonderry Apple Tree Mall near Shaw's and say hello today. You'll be glad you did. There's a lot that goes into your cup of coffee, so much more than many of use even know. That's why Coffeeberries is a proud supporter and purveyor of Fair Trade products. Find out what this means to the industry, our store, and most importantly, you, our customer. When we expanded the store in 2011 we suddenly had plenty of blank wall space. In thinking about what to do with this space we dedided to use it as a venue for local artists and photographers to display their work. Thus, our "art gallery" was born. Artisits have the two walls in the seating area for a month, giving the shop a fresh look on a regular basis. We are always looking for folks interested in showcasing their work, so if you are an artist, or know one, please get in touch with us.